Courgettes are a regular ‘problem’ for me every summer – always more than I can cope with so I’m always looking for great ways of using them up. Every year it’s the same. But never before have I been in the situation I find myself this year – too much sweetcorn! I grow sweetcorn every year with mixed success, but this year I have 2 varieties, Lark and Sweet Sensation, and for some reason they have both performed marvellously, each plant giving 2-3 full size cobs with the most amazing flavour. I’m delighted – I love sweetcorn, but am now looking for interesting ways to use them up. This is an interesting take on Risotto – surprising much more subtle than it may sound. The bacon adds a gently background influence and the real start is the sweetcorn. The colours are, well, sublime. 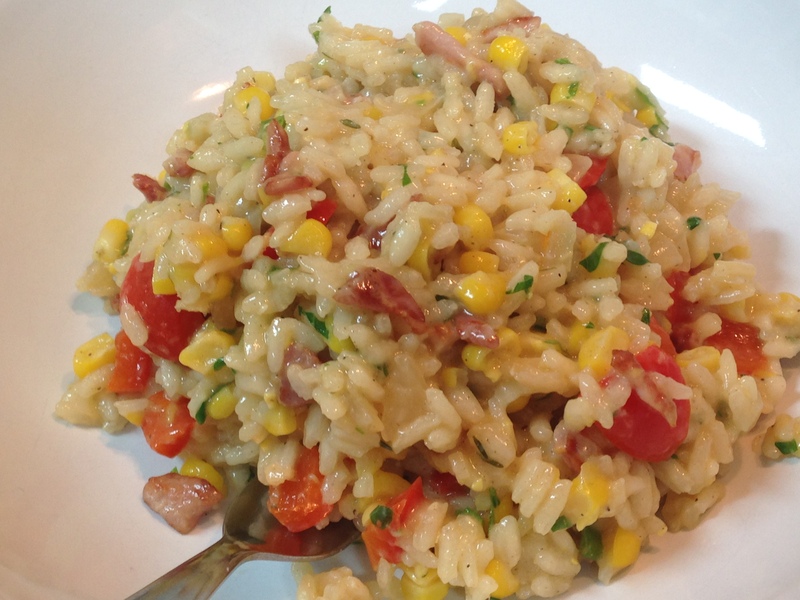 What a superb way to use up any excess sweetcorn!